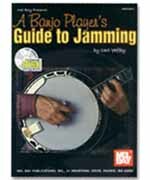 If you can play a few tunes on the bluegrass banjo but haven't played much with others (or at all), this book will show you what you need to know to sit in on a hot jam session. Geared toward beginner and intermediate players, this book covers playing chords, including which ones to play and when to play them. You'll also discover how jam sessions work and how to act in a session, along with advice on practicing at home. The included CD contains nine tunes performed at a typical jam session. The music is on the left channel with dialog about the tunes such as the name, the key, and the chord progression on the right. This high quality audio CD contains 23 dynamic jam tracks of country and bluegrass music. The extended jams (3 to 4 minutes each) are in a wide variety of keys and grooves, allowing you to play any style of music. In addition, several tunes are played at 2 different speeds. Also includes a helpful 16 page instruction booklet with rhythm charts and soloing tips for each song.